Republicans and conservatives — despite the lies, slander and fake news offered by the liberal media — value and celebrate immigration. But only if it’s done right. Only if immigrants come here legally. I was going to write a column about why President Donald Trump is on his way to re-election by a wide margin. I was ready for liberals to scoff at my prediction. Politico reports that despite Trump’s supposedly low approval numbers, if the election were held today, multiple economic models with strong track records of predicting presidential election results show Trump would win in a huge landslide. It’s beginning to dawn on Democrats: President Trump is going to win re-election. But why? It’s not just the economy. It’s immigration. Republicans and conservatives — despite the lies, slander and fake news offered by the liberal media — value and celebrate immigration. But only if it’s done right. Only if the immigrants come here legally, if they work hard to become American citizens, if they come here to work, not seek out welfare. I was honored this past Friday morning to be invited to the U.S. citizenship ceremony for Alex Sajdak, at the federal courthouse in downtown Las Vegas. It was my first-ever citizenship ceremony. Alex came to America from Mexico. She did everything the right way. She became a new U.S. citizen on Friday with her proud husband, Dave, the chairman of the Clark County Republican Party, grandson Justin, and a huge contingent of proud fellow Republicans as witnesses. I sat in the courtroom watching nearly 50 new U.S. citizens take their pledge of allegiance to our great country. I cheered each of them — because they did it the right way. 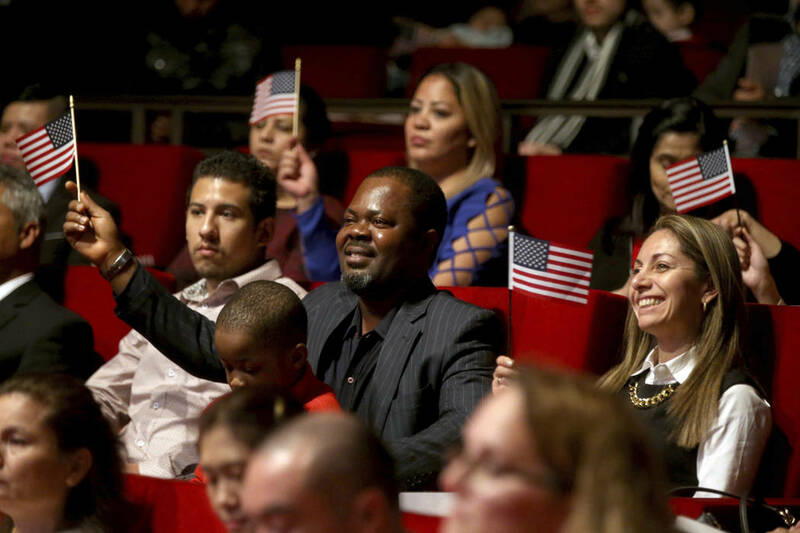 Each of these new citizens had one or two guests. Alex had almost the whole Clark County Republican Party leadership in attendance. About 30 of us turned out to root Alex on. You’ve never seen such proud Republicans in your life. So much for the narrative that Republicans don’t like immigrants. Alex didn’t just wave an American flag. She looked like the American flag — she dressed in red, white and blue. This new federal regulation will ban welfare-dependent immigration. Immigrants will no longer be allowed to permanently resettle here if they are a burden on U.S. taxpayers. In other words, we only want new citizens who value work, not welfare. Those who can’t or don’t want to support themselves, without being a burden on taxpayers, can go home. This new Trump rule will save American taxpayers billions of dollars. The citizens and taxpayers of America say thank you, President Trump. Now you know why President Trump will win re-election by a wide margin, maybe even a landslide. Congratulations on becoming a citizen, Alex Sajdak. We’re thrilled to have you and millions of other wonderful, patriotic, hard-working, law-abiding, legal immigrants. Wayne Allyn Root (Wayne@ROOTforAmerica.com) is host of the nationally syndicated “WAR Now: The Wayne Allyn Root Show.” Listen from 3 to 6 p.m. daily at 790 Talk Now and watch at 5 p.m. on Newsmax TV, now on DirecTV and Dish.